I'm obviously not there yet - but I'm happier with this one than the first (even if I was too lazy to weave in all the little nibbly ends.) Thank you to everyone who commented and emailed with such great advice! I did dink around and reduced the number of chains that I used between clumps (don't you love my use of the technical terms?) I've still got to say, the tension thing still feels awkward. Oh well. Exhibit B: Progress on the De-cluttering Front. 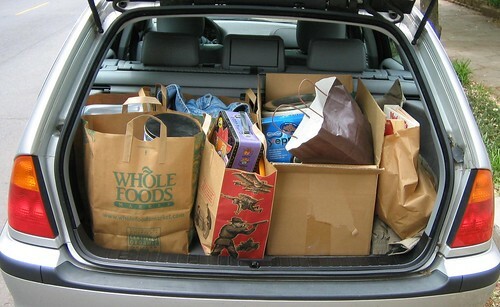 The good news is, this is my little wagon stuffed to the gills with stuff that's going to the Salvation Army. The bad news is that the kitchen still isn't done. Sigh. And I just have to ask - do real photographers have to put up with stuff like this??? WooHoo!!! 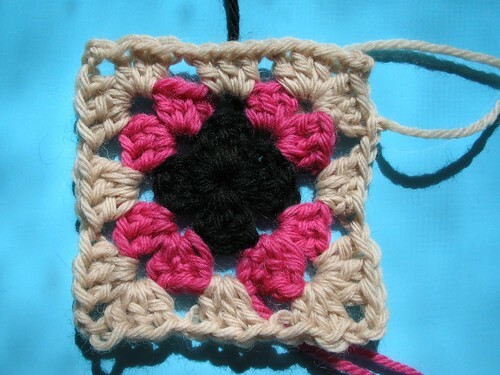 Now THAT's a good lookin' granny square! You're a pro now -- we'll be seeing a finished afghan in no time. damn you thing one and/or thing two! Look at you go! Loading up the wagon with goodies for the poor. And What About Bob is one of my favorite movies of all time. "And I'll be peace." HA HA AH AH AHAHA! COuld you come clean out my house next? I think that my pile of "stuff" woudl bury your little wagon. I just love those sneaky Things!!! Oh, yeah. I had a fluffy calico trying hedge in between the camera and that baby ball as I was trying to photograph it yesterday. Aidin finally had to hold her while I snapped the pictures. I'm a huge fan of loading my wagon up and getting rid of stuff too! that photo shoot looks oddly familiar:) while i was trying to take some pictures today, my cats would not stay away from the camera! gorgeous granny square. how lovely. i'm sorry i missed out on your burgeoning crochet career. how did i knot know this? i'll stop my slack ways and try to do better. you are so smart for getting rid of stuff. we need to do that too. no comment on that last thing.